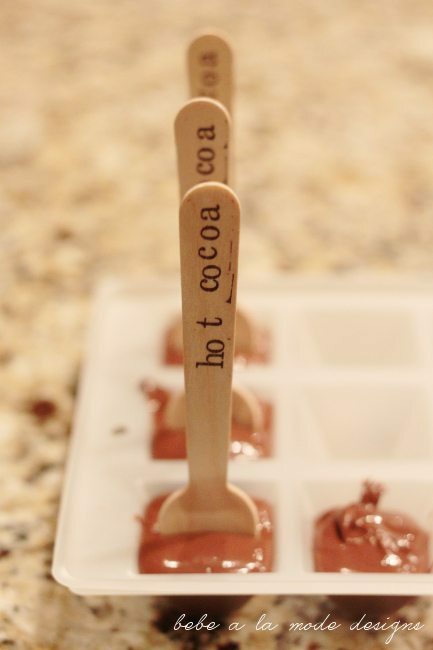 I wanted to share a fun way to make hot cocoa…on a stick! As an added bonus, it comes with a printable. DOUBLE bonus…it makes a wonderful gift! 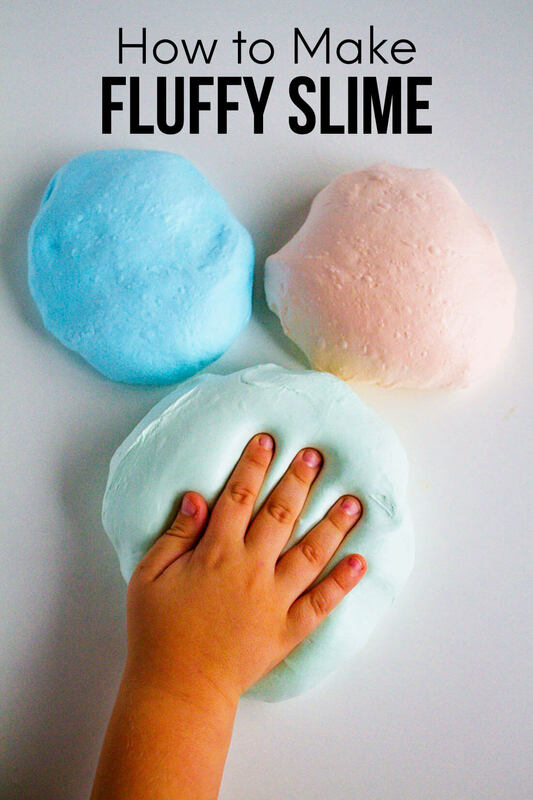 And TRIPLE bonus…it requires no baking! If you like all things hot chocolate, there is another fun recipe for Reindeer Hot Cocoa. Or you could make a hot cocoa station too! 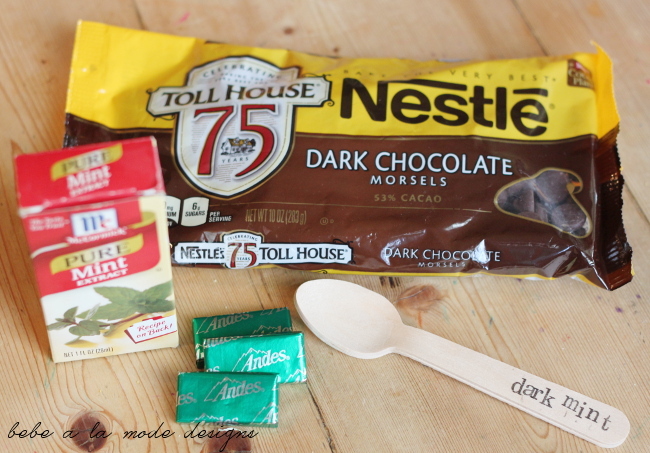 And there’s even a post on how to make hot chocolate ornaments. 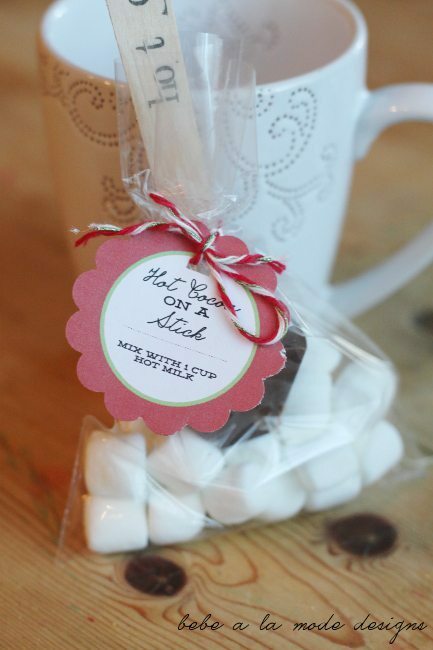 One more gift idea – make a hot chocolate gift kit and attach a cute printable. 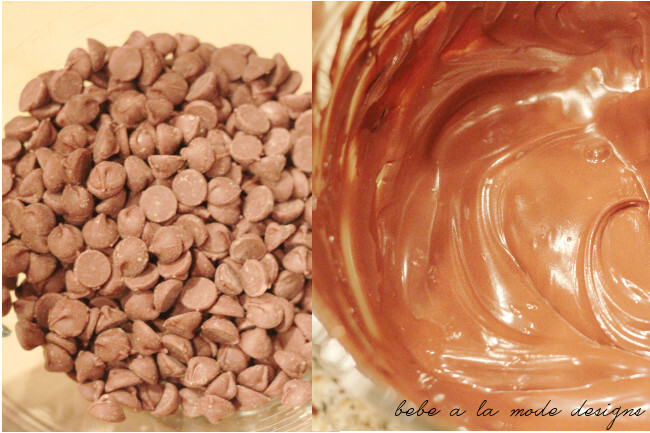 Start with 2 cups of chocolate chips. Use milk, dark, white or semi-sweet chocolate. Place in a microwave-safe bowl and microwave at 70% power for 1 minute. Stir. Return at 100% power for 15 seconds. Stir and repeat until completely melted. If using a flavor, add 1 tsp. extract and mix well. 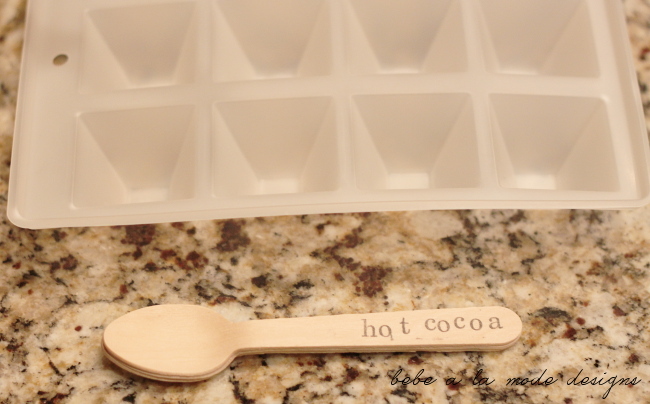 Spoon into ice cube tray or silicone mold. A baby food tray (like this one) works well too. I used a Jello Party Mold. Insert disposable spoons and refrigerate until hardened, about 30-40 minutes. 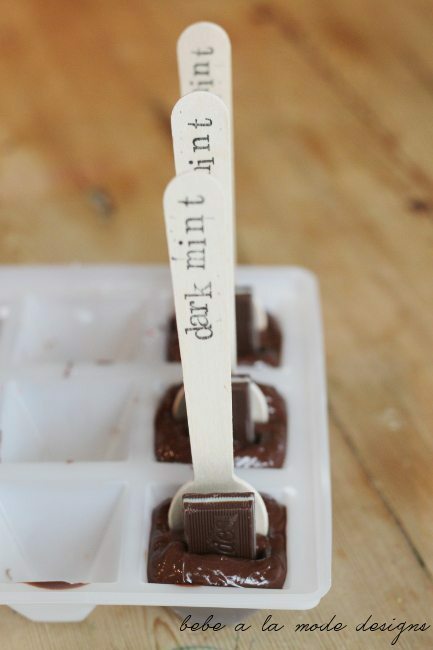 One of my favorite variations is a Mint Dark Chocolate, topped off with an Andes mint! There are so many great combinations! 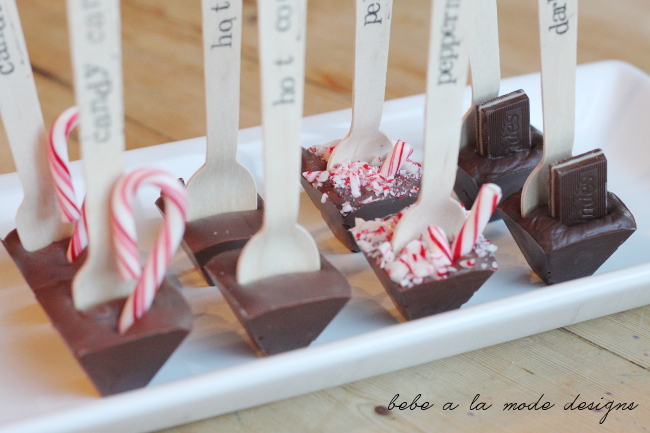 Insert a candy cane or crushed peppermint candies for a festive holiday treat! To use, stir into 1 cup of hot milk. Or package with marshmallows to give away. 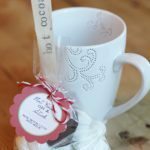 Tie it up with this cute printable and include a mug for an adorable gift for a teacher, co-worker or neighbor. 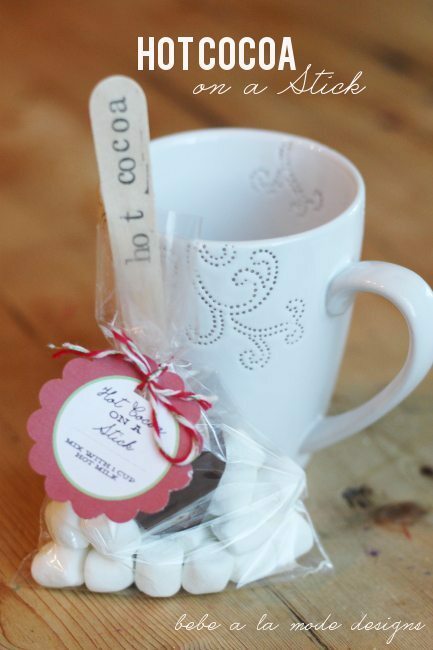 Hot Cocoa on a Stick is a fun and yummy way to make hot chocolate - and it can be customized with so many different flavors and makes a super cute gift! Assorted toppings: candy canes, crushed peppermint candies, chocolate mints, etc. Microwave at 70% power for 1 minute; stir. Microwave on high for 15 second increments; stir. Repeat until completely melted. Spoon into mold (silcone or ice cube tray). Refrigerate until set, about 30-40 minutes. To serve, mix into 1 cup of hot milk. Nutrition info is for the 2 cups of chocolate chips and 1 tsp of mint extract only. Hi – my first batch of these came out beautifully for teacher’s gifts. I tried to make a second batch and added vanilla extract after melting the chocolate and it instantly became a clumpy unusable mess. Any idea what went wrong? Should I have used the extract at a different time? I usually twist the ice cube tray. If that doesn’t work, try placing the bottom of the tray/mold in hot water for about 20-30 seconds. They should come right out. My mom Loves hot chocolate but hates milk. She makes it with water. Could you use hot water with these instead of the warm milk? I haven’t tried these with water and not quite sure how that would come out. If there was a milk alternative that she likes (soy, almond, etc.) I would recommend that. 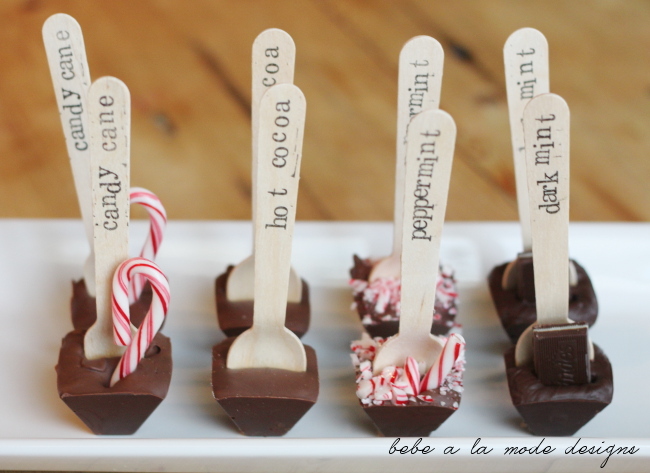 I want to make the hot cocoa on a stick as gifts. I am having a problem ordering the mold you used, must be an issue with the website and they are not able to help me. I can order similar molds elsewhere but I am not sure of the size I should order? If they are to small then they will not taste chocolatey enough. Could you tell me the size of the pyramid cups you are using? Hi Sharon, sorry you’re having trouble ordering the mold :( It holds 2 tablespoons. There is a link in the above post for a square mold (baby food mold) that would work nicely too. Could you let us know specifically which stamp you used to for the spoons? So cute! Very easy and looks like a lot of effort goes into it and very affordable. I love this idea. I would stamp things like sweet teacher! Lol best idea I’ve seen in a long time. Where would I find this on your pinterest? This will be one to do! If the recipient isn’t going to use these right away, do they need to keep them refrigerated? This is a really cute idea!! Could you post pics of how the finished product looks when stirred into the hot milk. I have never had any luck stirring dark chocolate into any hot liquid…I’ve tried it with coffee. I had no idea you could stir chocolate chips into milk and it taste like hot cocoa!! Oops…forgot a ?. I am my own Grammar Nazi!! I am making these as neighbor gifts this year with mugs…I was running out of new ideas. THis is awesome and adorable. How many does 2 cups of melted chocolate make? Thanks! It will make 10-15 servings, depending on how much goes into the mold. Love it! Did you stamp the spoons? Who wouldn’t love this for a gift?! Where are the spoons from and how did you print on them!? You can get the spoons on Amazon or Etsy. There is link above :) I stamped them with a small alphabet stamp set. 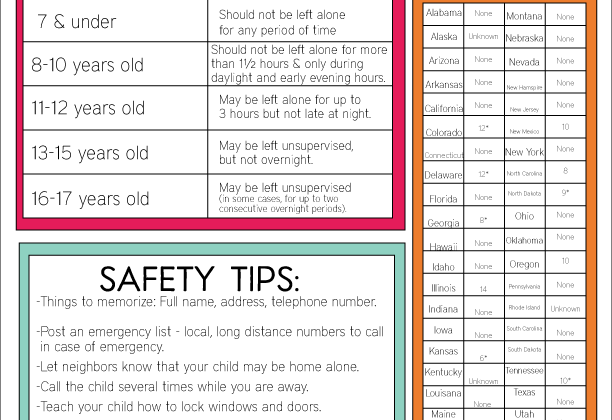 I am loving this, I will be making for the my mail person, teachers, and myself. Thanks for the share. Pinned!